"It's the love of singing that brought me to Diamond State Chorus. It's the enthusiasm, fun and lasting friendships that keep me returning week after week. I love it!" Diamond State Chorus is more than just an a cappella ensemble, it is a family. We love getting together each week and sharing friendships as well as great music. 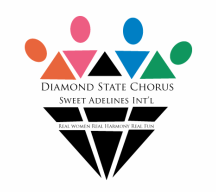 If you like to sing, you're invited to visit Diamond State Chorus and discover REAL WOMEN, REAL HARMONY, REAL FUN!! You'll have the opportunity to hear us perform four-part, a cappella harmony, and you'll be invited to join us on the risers to experience the music, friendship and fun for which Diamond State Chorus is known! Women of all ages are invited to attend. For more information, contact us! All of your new friends are there!